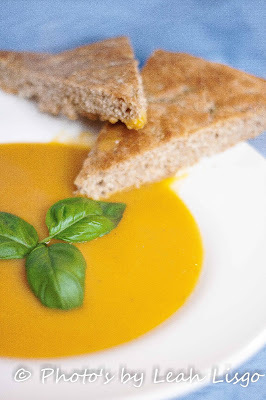 This is probably my favourite soup to make and eat, I particularly love to eat it on a cold Autumn evening. Growing up I never was a big fan of soups. Now that I'm an adult I realise that the reason was probably because I either like a stew with big chunks of meat and veg or a soup which has been blended. So this is the perfect soup for me and I've had others who aren't a fan of soup tell me they love this recipe and even go back for a second helping. This recipe was passed to me from a friend who lives in Australia, she makes the soup with pumpkin instead of butternut squash. You can make it with either, but it is harder to get pumpkin in the UK unless it's Halloween time, so I always make it with the squash. This is such a simple recipe, you could make a big batch and freeze portions.